Canoeing for disabled people. Kayaking and canoeing can give everyone a chance to enjoy some exercise and fresh air. Image courtesy of Special Olympics Great Britain. Canoeing is a highly diverse sport which provides something for everyone, regardless of our age or ability. Canoeing allows us to enjoy some exercise, share a challenge and gain independence whilst also having lots of fun and getting out in the fresh air. To promote and develop canoeing for disabled people, the British Canoe Union and Canoe England have devised the concept and term PaddleAbility to address the issue of participation in canoe sport and canoe recreation. 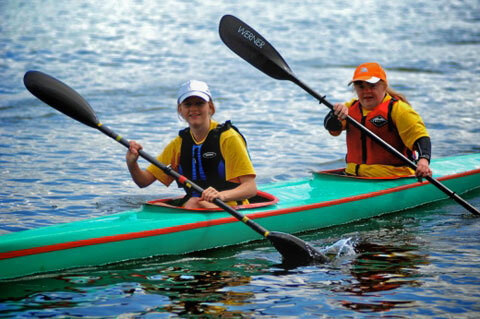 PaddleAbility focuses on the individual’s ability in canoeing rather than disability. The International Canoe Federation includes Paracanoe as a discipline, providing opportunities for paddlers with physical disabilities to participate and compete at club, national and international level. Whilst not a fixture at the 2012 Paralympics, ParaCanoe will be a fixture at the 2016 Paralympics in Rio– allowing disabled paddlers to take part at the very highest level of competitive paddlesport. The aim of the Special Olympics is to provide sports training and athletic competition in a variety of Olympic-type sports for children and adults with intellectual disabilities. The Special Olympics provides an opportunity for those with intellectual disabilities to develop physical fitness, demonstrate courage, have fun and share skills and friendship with their families, other athletes and the wider community. The Great British Special Olympics canoe squad bought back ten medals from the 2011 games, and teams will be competing at the next Special Olympics World Winter Games to be hosted in Pyeongchang, South Korea in 2013, and the next World Summer Games to be held in Los Angeles in 2015.